H358 is a non-small cell lung cancer (NSCLC) cell line that harbors a KRAS mutation. KRAS mutations are found in >25% of lung adenocarcinomas leading to constitutive activation of the growth-promoting RAS signaling pathway. 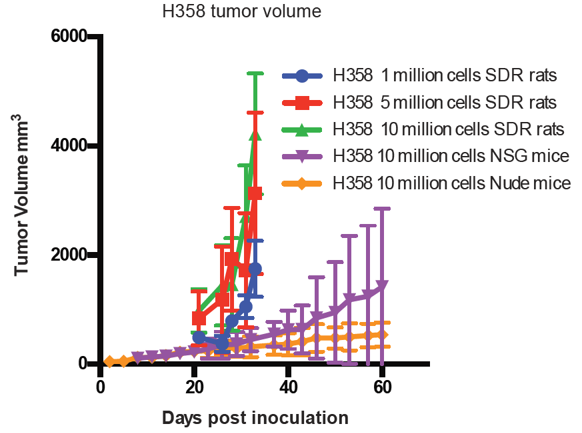 H358 cells were established from a chemotherapy-naïve NSCLC tumor. Many of the targeted therapies that have been studied and approved for the treatment of NSCLC specifically target the EGFR – KRAS – BRAF – MEK – ERK signaling kinase cascade as oncogenic addiction to these growth factor signals are commonly observed in NSCLC1. Many attempts to target KRAS directly to this point have been unsuccessful. KRAS also influences the AKT/PI3K and other growth and proliferation pathways, and mechanisms to target mutant KRAS through other pathways are also underway2,3. For this reason, the NCI/NIH has begun the RAS initiative to promote research aimed at targeting oncogenic RAS in cancers4. Interestingly, H358 cells are highly sensitive to anti-EGFR therapies, despite having an oncogenic KRAS activation mutation. Additionally, H358 has no other major tumor suppressor or oncogenic mutations. This makes H358 an imperative NSCLC cell line model for trying to understand the complex role of KRAS mutations in NSCLC. The OncoRat demonstrated a 100% engraftment rate for the H358 xenograft model, providing an ideal host for H358 tumor biology. H358 xenografts in Hera’s engineered rat models achieve tumor volumes up to 15 times greater than those in the NSG mouse in the same time frame. Additionally, successful take rates are far superior to those in NSG mice. Hirsch FR, Scagliotti GV, Mulshine JL, et al. Lung cancer: current therapies and new targeted treatments. The Lancet. 2017;389(10066):299-311. Sangodkar J, Perl A, Tohme R, et al. Activation of tumor suppressor protein PP2A inhibits KRAS-driven tumor growth. The Journal of clinical investigation. 2017;127(6):2081-2090. Kauko O, O’Connor CM, Kulesskiy E, et al. PP2A inhibition is a druggable MEK inhibitor resistance mechanism in KRAS-mutant lung cancer cells. 2018;10(450):eaaq1093. National Cancer Institute. The RAS Initiative.